Cooling systems from OEC Industrial offer a low cost solution to the problem of controlling heat in industrial buildings such as factories, warehouses, transport depots and foundries. 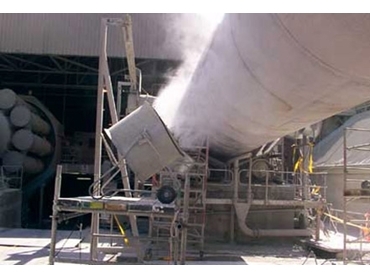 Cooling solutions such as OEC’s fogging systems help create a cool, healthy and efficient work environment. Designed for efficient heat control, OEC fogging systems direct water at high pressure through a battery of nozzles to create millions of ultra-fine micro-droplets. The nozzles are typically spread evenly at roof or ceiling height throughout the factory or building, and fed from a high pressure water line. Invisible to the naked eye, the micro-droplets are directed into the area to be cooled, evaporating within a few seconds of their creation to cool the air and the objects around them without any wetting or residual moisture problem. OEC’s fogging systems are employed by Simon National Transport Depot (Brisbane), Bradken Foundry (Runcorn, QLD and Kilburn, SA) and AGR Matthey (Perth Mint).